(Photo: © Peter Kenny)Archbishop of Cape Town, Thabo Makgoba, the South African Anglican leader speaks at a gathering during the Busan Assembly of the World Council of Churches on November 6, 2013. A group of 24 religious leaders in South Africa have expressed concern about the high levels of corruption, service delivery failures and land issues that plague the country as well as the marginalization of mixed-race communities and people of Indian descentd due to political attacks on them. 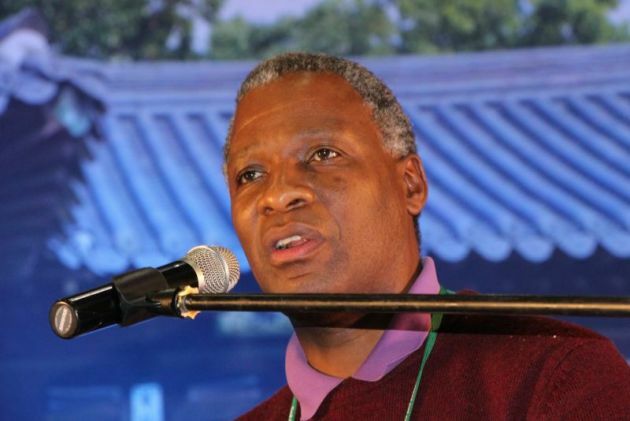 The leaders includes Anglican Archbishop Thabo Makgoba, representatives from the South African Council of Churches, the Muslim Judicial Council and the Roman Catholic Church, News24 reported. The leaders met at the annual National Church Leaders' Consultation (NCLC) this week for their annual meeting. The acknowledged that the government has made progress in providing resources to the poor and is "asserting constitutional democracy." The leaders said in an Oct. 25 statement they are "deeply disturbed" by corruption, the weakening of state institutions, the mismanagement of State-owned enterprises and "increasing evidence of the plundering of public resources as so far revealed in the commissions and reports addressing [State] capture." The religious leaders cited recent protests in a poor area of Johannesburg inhabited mainly by mixed-race people, as well as protests all over the country, were evidence of that local governments have not delivered on their commitments. They mentioned that the mixed-race or as they are called in South Africa, Colored community's feeling of exclusion and marginalization and the political attacks on made on South Africans of Indian descent. "We recognize the growing pain in the feeling of exclusion and marginalization of the Coloured Community; and the emerging political attack on the Indian population which undermines the quest for nation building," they said. The religious leaders have appointed a task team to conduct research into the land question, and say they are "committed to playing a vital role as churches in addressing the issue of land reform and redistribution." The group said churches and faith leaders were "called to be agents of hope, healing, peace, unity and reconciliation." They committed to "speak truth to the Church and to power; reclaim the prophetic voice of the church; work against racism and xenophobia in our public discourse, and act against violence and the exploitation of women in church and society." "Church leaders are mindful that the matters raised above are not only relevant to South Africa, but to the broader SADC (Southern African Development Community) region and even globally," they said. "We call on all church leaders to exercise their pastoral and prophetic ministry in addressing the challenges we identify and encounter."